In my excitement at the news that the floods were back in my last post I forgot to mention a couple of snippets of other news. Firstly the GREAT WHITE EGRET was seen again up at Wolvercote Lakes by Steve Goddard a day or two later. It wouldn't surprise me if it become a regular visitor there. Secondly Mary MacDougall reported a BARN OWL sighting in Burgess Field last week so it might be worth keeping an eye out there in the days and weeks ahead. I did go and have a look for it the next day but all I saw was a small flock of FIELDFARES - my first of the season (and I've still personally yet to see any Redwings). As a point of interest a couple of days ago a Glossy Ibis was seen at 3pm at Farmoor and then some fifteen minutes later was spotted flying over Otmoor. Now a straight line between the two locations does pass over Port Meadow so it looks like we missed a nice sighting there. As a matter of interest, this distance is some 9 miles so at 36 mph this bird was going at quite a pace! One other item: a drake American Wigeon was spotted in the west of the county at a private location a day or two ago though apparently had gone the next day so it's worth checking out the Meadow Wigeon flock carefully in case it's come our way. This evening I went to check out the floods for the gull roost to find the whole area almost completely empty of birds. Having been out earlier in the day on a run and seen plenty of Wigeon and Teal I can only assume that some dogs must have run amuck just before my arrival. Just about the only birds present were some gulls though in the pleasant weather conditions the roost was typically small and the birds were typically skittish, with great chunks of the flock periodically being scared off by something and heading off to Farmoor. As a general rule, the better the weather the worse the gulling. 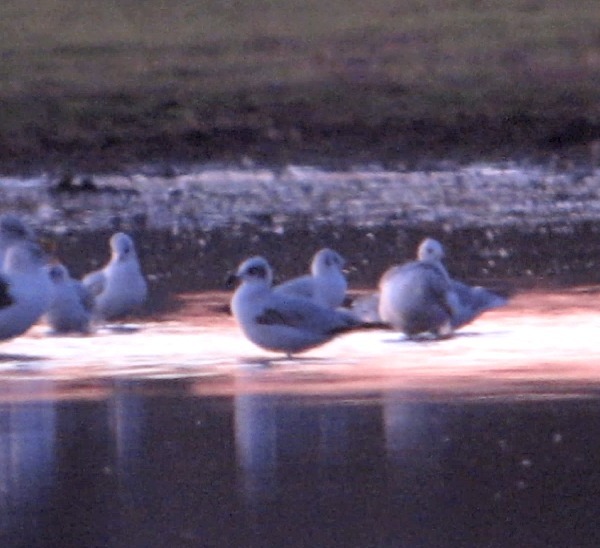 Anyway, unusually there were hardly any small gulls around at all but just at last light Thomas Miller managed to spot a first winter MEDITERRANEAN GULL in amongst the few dozen Black-headed Gulls - a great find! This species is pretty much annual on the Meadow though with just one or two records a year it's always something to get excited about and it marks the first noteable gull of the season. Let's hope for plenty of others to follow!